One of the most successful political campaigns of recent years has been on school-funding, with various teaching unions driving home the message that state schools are desperately under-funded. This week, though, their credibility suffered a serious blow. Responding to a well-publicised campaign run by the National Education Union (a merger of the NUT and ATL unions), the UK Statistics Authority said that it was unable to confirm the numbers behind the campaign “as the underlying data are not publicly available and the methodology is not wholly clear.” Rather awkward for the NEU itself, but also the educational establishment which had taken on their message pretty wholeheartedly. So where did it all go wrong? As a former headteacher myself, I’ve got a pretty good idea. The idea that schools are losing funding isn’t new: it’s been the message of teaching unions for years. The difference is that, in recent years, they’ve started to get more ‘creative’ about how they push it. Take the ‘Schools Cuts’ campaign – something which is widely credited as making education funding one of the most important issues at the 2017 General Election (potentially costing the Conservatives their majority). 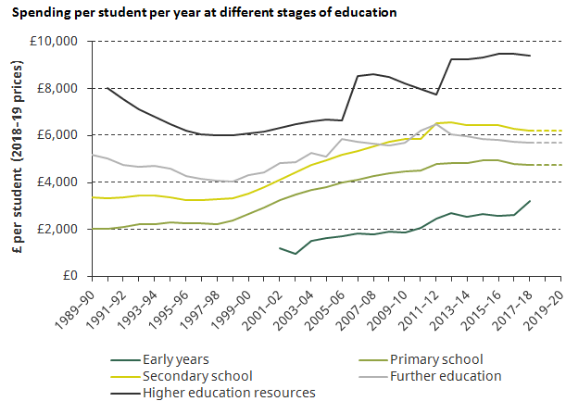 Even though per-pupil funding doubled in real terms between 1997 and 2015, and experienced a relatively modest squeeze after that, the ‘Schools Cuts’ campaign has been ruthless about its political line – but it’s also been very clever. In 2016, they unveiled their latest weapon: an interactive website – www.schoolcuts.org.uk – which allowed worried parents and teachers to find out how many pounds and teachers their school was doomed to lose, all at the click of a button. These easily understood stats spread across social media like wildfire – no wonder so many people’s votes were swayed. I was a Head during the 2017 GE. I had a good grasp of my school’s finances but the site scared the living daylights out of even me. I faced quite a few questions from worried parent, so I took a closer look at the assumptions underlying the calculations. Unsurprisingly they were all worst-case scenarios. They also assumed schools were incapable of finding savings other than by sacking teachers and teaching assistants. This created a new quandary for the unions though: they’d been so successful, what should they do next? They promptly rejigged their assumptions, reworked the calculations, and announced that the government had misled people. They claimed that far from protecting funding they were actually cutting it again, by £59 a kid. There was a slight problem though. In their haste to stick it to the government, and despite claiming that they’d had their statistics independently verified by experts, they’d forgotten to include a very important £450m pot of money. They were wrong, and the Department for Education was right. Cue a public retraction and private infighting over the embarrassment. And now, the latest development, a damp but damning response from the UK Statistics Authority. The Statistics Authority concluded there were three main issues with the approach taken. Firstly, the authors had mixed cuts that had already taken place with those projected for the future, ignoring the fact that increases were planned to offset previous reductions. On top of that they had inflated baseline funding such that it made declines for some worse than the reality, and made inaccurate claims that 91% of all schools in England and Wales were losing out (when in fact the calculation only covered England). It didn’t need to be like this, but having repeatedly played fast-and-loose with the facts the unions will now struggle to be taken seriously on an important issue for teachers. There is a silver lining though. They could refocus on the basics – helping members in schools – instead of criticising the Catholic Church, attacking Israeli companies, and getting in a pickle with percentages. As campaigns backfire tensions with their own staff are increasing, and more teachers are joining moderate alternatives like Edapt. This could be the catalyst the unions need to do their job better. Here’s hoping.